Congratulations to S. Klintworth who placed the winning bid of $1,250 for March's silent auction, a beautiful impressionistic seascape, "Port of Klaipeda", by Sergei Nikolaevich Vedeneyev, estimated at $3,500- $4,500. 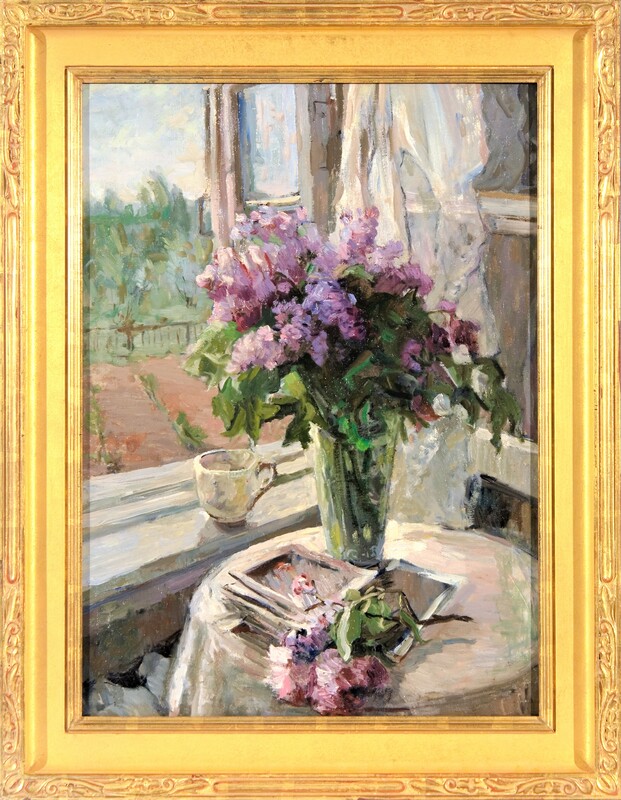 As our April silent auction, we are pleased to present a beautiful impressionist floral still life, "Lilacs by the Window", by Kapitolina Alekseevna Rumyantseva, estimated at $6,000- $7,000. 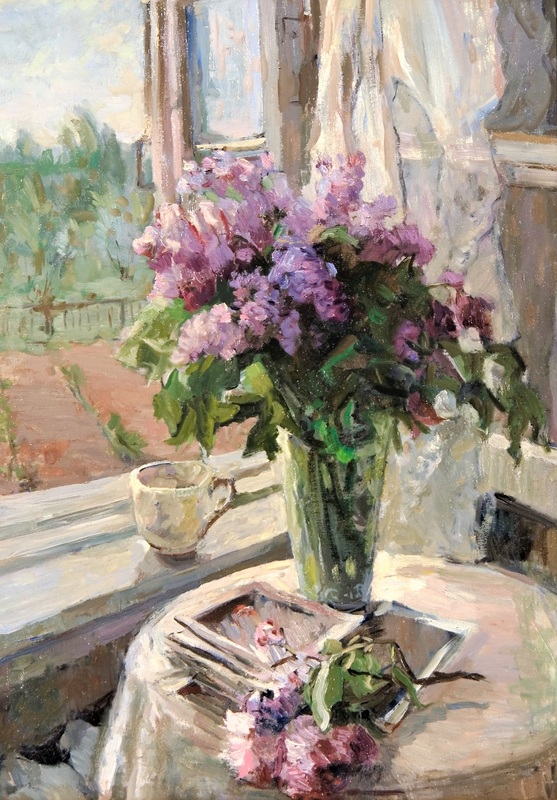 Kapitolina A. Rumayntseva, "Lilacs by the Window"
Bids will be taken via telephone, or e-mail until 7:00 pm MST, Monday, April 1st. Follow all the bidding updates on the Gallery's website. Remember, there is no reserve, at the end of the auction the high bid wins! Rumyantseva, Kapitolina Alekseevna (on December 16, 1925, Leningrad, the USSR - on August 8, 2002, St. Petersburg) - the Russian Soviet artist, the painter, the member of the St. Petersburg Union of artists (till 1992 - the Leningrad organization of the Union of artists of RSFSR). Kapitolina Alekseevna Rumyantseva was born on December 16, 1925 in Leningrad. In 1945 - 1950 was engaged in the Leningrad art normal school at G. Shah, D. Ryazanskaya, V. Petrova, M. Shuvayev. From 1950 to 1969 taught drawing at schools of the Moscow and Vasileostrovsky districts of Leningrad. Since 1969 worked as the artist in the shop of easel and monumental painting of Plant of picturesque art of decoration. Along with the beginning of the 1950th worked much creatively, generally in a genre of a landscape and a still life. In 1956 married the Leningrad artist V.S. Vilner, having accepted a surname of the husband. After the divorce in 1970 returned the maiden name. Since 1970 participated in exhibitions, exhibiting the works together with works by the leading masters of the fine arts of Leningrad. In 1973 it was accepted in members of the Leningrad Union of artists. Wrote mainly still lifes, landscapes and also genre compositions. The greatest popularity and recognition were gained by still lifes with flowers and fruit. In the early nineties Kapitolina Alekseevna Rumyantseva's works as a part of expositions of works of the Leningrad artists were presented to the European audience at a number of foreign exhibitions. Kapitolina Alekseevna Rumyantseva died on August 8, 2002 in St. Petersburg on the seventy seventh year of life. Her works are in the museums and private collections in Russia, France, the USA, Norway, Belgium, Italy and other countries. Her artistic fate is inseparably linked with the City of Saint Petersburg. She was were born and lived all her life in that city, which is the great artistic center of Russia with its wonderful museums and magnificent architecture. In her later years, Kapitalina recollected that she was taken to the Hermitage and the Russian Museum since her early childhood. The paintings of the famous artists, such as "The Snow Town Capture" by V.Surikov, "The Hercules" by M.Vrubel, "The Knight at the Crossroads" by V.Vasnetsov, "The Last Day of Pompeii" by K.Brullov fascinated and allured the little girls with their fabulous and fantastic subjects. In the course of time, every sister formed her own artistic principles, guiding lines and points. Nevertheless, the paintings beloved from their childhood were their good "teachers" educating them all their lives. In their youth, they studied the methods and techniques of their perfection in painting. At a mature age, those paintings gave them cause for reflecting and meditating about the sense and meaning of the earthy vain life. Kapitalina Rumayntseva graduated in 1950 from the Tavrichesky Artistic and Pedagogical College. She was married and gave birth to her son in the difficult post-war years. She painted mainly for herself, for her soul. At the end of the 1960-s she began actively devoting her time for to her art. Her genre compositions, landscapes, still life were presented in various exhibitions. In 1973, she entered at the Leningrad Branch of the Union of Artists (LOSKH). The rest of her life was spent on her art and it became the sense and the purport of her life. She skillfully combined the traditions of the Russian realistic painting, acquired in her early childhood, with her own style. The paintings of K.Rumyantseva were many times exhibited including in the 1990's in exhibitions in Europe and the USA. Kapitolina Alexeevna Rumyantseva December 16, 1925, Leningrad, USSR - August 8, 2002, Saint Petersburg, Russian Federation) was a Russian Soviet realist painter and graphic artist, who lived and worked in Saint Petersburg (former Leningrad). 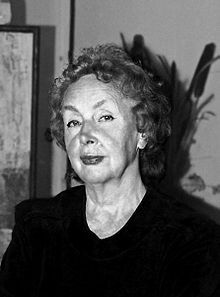 She was a member of the Saint Petersburg Union of Artists (before 1992 named as the Leningrad branch of Union of Artists of Russian Federation), regarded as one of representatives of the Leningrad school of painting, most famous for her still life paintings. A. Rumyantseva Capitolina was born December 16, 1925 in Leningrad. In 1950 Kapitolina Rumyantseva graduated from Tavricheskaya Street Art School in Leningrad. A Pupil of G. Shakh, D. Rezanskaya, V. Petrova, M. Shuvaev. Worked as an Art Teacher in secondary schools (1950-1969). Since 1970 she has participated in Art Exhibitions. Member of LCRAU since 1973. Painted still-life's, landscapes, subject pictures. Her brushwork evolved in the direction of strengthening the local color and decoration, while maintaining interest in the subject, give an invoice and material tangibility. Generated images invariably filled with lyricism and poetic sound. Was a member of the St. Petersburg Union of Artists (before 1992 - Leningrad branch of Union of Artists of the RSFSR) in 1973. Rumyantseva Kapitolina died a August 8, 2002 in St. Petersburg at the seventy-seventh year. Her works are in museums and private collections in Russia, France, USA, Norway, Belgium, Italy and other countries. • Paintings 1940-1990 period. Leningrad School. Exhibition of works . - St. Petersburg Memorial Museum Nekrasov, 1996. - P.4. • Study in the works by Leningrad artists. Exhibition of works. Catalog . - St. Petersburg Memorial Museum Nekrasov, 1994.- P.6. • Directory of members of the Leningrad branch of Union of Artists of the RSFSR . - A: Artist of the RSFSR, 1987. - P.113. • Sots'Art a St Petersbourg. Catalogue. - St Germain en Laye: 23 Fevrier 1992. - P.3. L'Ecole de Saint-Petersbourg. Drouot Richelieu. Paris, 1994. • Ivanov SV Unknown Socialist Realism. Leningrad School. - St. Petersburg: NP-Print, 2007. - P.154, 222, 237, 259, 368, 396-398, 404, 405. ISBN 5-901724-21-6, ISBN 978-5-901724-21-7. • Regional Exhibition of works by Leningrad artists of 1980. Catalog. - A: Artist of the RSFSR, 1983. - P.11. • Contact times. 1932-1997. Artists - Members of Saint - Petersburg Union of Artists of Russia. Exhibition Catalogue . - St. Petersburg: "Manezh", 1997. - P.297. • Leningrad artists. Paintings 1950-1980 period. Catalog. - Saint - Petersburg: 1994. - P.6. • Autumn Exhibition of works by Leningrad artists of 1970. - A: Artist of the RSFSR, 1972. • Our contemporary. Regional Exhibition of works by Leningrad artists of 1975. Catalog . - A: Artist of the RSFSR, 1980. - P.13. • Poems in the works of artists of the war generation. Exhibition of works. Catalog . - St. Petersburg Memorial Museum Nekrasov, 1995. - P.6. • Exhibition of paintings - women of Leningrad in 1975. Catalog . - A: Artist of the RSFSR, 1979. - P.4. • Still. Exhibition of works by Leningrad artists of 1973 . - A: Artist of the RSFSR, 1973. - P.8. • Our contemporary. The second exhibition of works by Leningrad artists of 1972. Catalog . - A: Artist of the RSFSR, 1973. - P.
• The Fall Exhibition of works by Leningrad artists of 1970. Catalogue. - Leningrad: Khudozhnik RSFSR, 1972. • Our Contemporary The Second Exhibition of works by Leningrad artists of 1972. Catalogue. - Leningrad: Khudozhnik RSFSR, 1973. - p. 6. • The Still-Life Exhibition of works by Leningrad artists. Exhibition catalogue. -Leningrad: Khudozhnik RSFSR, 1973. - p. 8. • Our Contemporary regional exhibition of Leningrad artists of 1975. Catalogue. - Leningrad: Khudozhnik RSFSR, 1980. - p. 13. • Exhibition of works by Leningrad women-artists of 1975. Exhibition catalogue. - Leningrad: Khudozhnik RSFSR, 1979. - p. 4. • Regional Exhibition of works by Leningrad artists of 1980. Exhibition catalogue. - Leningrad: Khudozhnik RSFSR, 1983. - p. 11. • Directory of members of the Leningrad branch of Union of Artists of Russian Federation. - Leningrad: Khudozhnik RSFSR, 1987. - p. 113. • The Leningrad Artists. Paintings of 1950-1980's. Exhibition catalogue. - Saint Petersburg: Saint Petersburg Union of artists, 1994. - p. 5. • A Painting from the life by Leningrad artists. Exhibition catalogue. - Saint Petersburg: Nikolai Nekrasov Memorial museum, 1994. - p. 5. • The Lyrics in the works of artists of the war generation. Painting, drawings. Exhibition catalogue. - Saint Petersburg: Nikolai Nekrasov Memorial museum, 1995. - p. 5. • Still-Life in painting of 1940-1990's. The Leningrad School. Exhibition catalogue. - Saint Petersburg: Nikolai Nekrasov Memorial museum, 1997. - p. 6. • Link of Times: 1932 - 1997. Artists - Members of Saint - Petersburg Union of Artists of Russia. Exhibition catalogue. - Saint - Petersburg: Manezh Central Exhibition Hall, 1997. - p. 297. • Sergei V. Ivanov. Unknown Socialist Realism. The Leningrad School. - Saint Petersburg: NP-Print, 2007. - 448 p.
• Still life painting in 1940-1990 years. Leningrad School. • Exhibition Catalogue. - St. Petersburg Memorial Museum Nekrasov, 1997. - P.4.